Avg. Group Discount of 7.7%! Near Hawaii Convention Center, Ft. DeRussey and Hale Koa Hotel, near a variety of restaurants and shops and the new Waikiki Beach Walk. This hotel is priced well and in a good location. Very close to beaches and shopping. Downtown Waikiki is crowded and expensive. This hotel does not have adequate parking and so you must roam around the city looking for other lots or meters if you arrive after about 6 pm. Their garage fills quickly. Be reminded that all parking in Waikiki is terrible. Pros: The staff here is really fantastic. Always helpful and quick to bring up a blanket or say "hi" to you at check in. I got good responses from customer service when I asked about parking etc. The breakfast, also, is amazing! Really a super breakfast that saves time and money for hotel guests. The game room is pretty fun and the little mini golf course kept my kids busy one afternoon. Price is better than most. Cons: the pool is really not much of a pool at all. Parking, as mentioned, is inadequate. Rooms are really tiny. If you have two doubles beds, there is barely room to scoot around them to get to the bathroom. 24-Jun-2018 Verified Review, stayed from Sun Jun 17 to Sun Jun 24 2018 at a $189.00 group rate (3% discount). "A Perfect Location for my Destination Wedding!" My husband and I are from Oahu, but we had over 50 guests come from the mainland US for our wedding. Holiday Inn Express took great care of us and our families. Our room was even upgraded to an ocean view. Regan was extremely helpful throughout the process of setting up our group booking. Thank you! 21-Jun-2018 Verified Review, stayed from Sat Jun 09 to Tue Jun 19 2018 at a $169.00 group rate. The new guest rooms feature complimentary Wi-Fi with six (6) access points on every guest floor, a 50-inch flat screen TV, compact refrigerator, microwave, Keurig coffeemaker with complimentary coffee and hot tea pods. A Holiday Inn standard is Bath & Body Works brand bathroom/shower amenities. Guests enjoy access to our roof top recreational sundeck that includes pool, jet spa, 9-hole mini put golf course, giant chess game, shuffleboard, weekday yoga classes, foosball table, ping pong table, kids' game room with TV's and Wii consoles and games. The new 24 hour fitness center is over 1,200 square feet and equipped with modern machines and free weights. Laundry services ($) are also available for your convenience.In addition to being a short 10 minute stroll to Waikiki beach the Holiday Inn Express Waikiki is conveniently located at the gateway of Waikiki with easy in/out access to the freeway, convention center, world class shopping and dining for all price points. 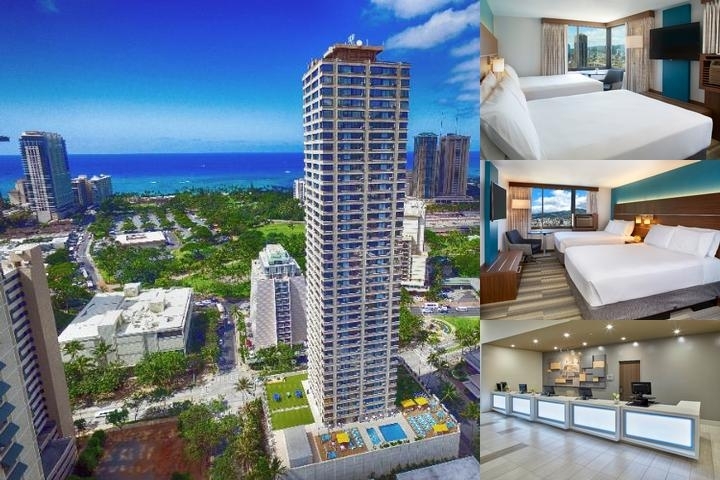 This 44-story hotel offers panoramic view of Waikiki Beach, Ko'olau mountains, downtown and Waikiki city skyline. Hotel Features: You can't get more of Hawaii indoors anywhere else than in the Maile Sky Court, located right near the beach in the neighborhood of Waikiki. One of the best parts about this spectacular resort? It's smoke-free. There's the purity of Hawaii for you. Guest Rooms: Featuring 596 beautiful guest rooms, you'll love the shower-tub combinations with toiletries and hair dryers. For a surcharge, you can get your wired high-speed internet if you've brought a laptop or smartphone. In addition, as it should be with every high-quality resort, televisions have your favorite cable channels and handy electronic/magnetic keys for easy in-and-out. Air conditioning, irons and ironing boards, and clock radios are the norm for these quality rooms. Nearby Attractions: It's also the norm to experience all that Hawaii has to offer as the Maile Sky Court has close access to the International Market Place, Waikiki Beach, Diamond Head, Ala Moana Center, and Honolulu Zoo. And don't forget the beach! You're just a shorwalk away from the white sand beaches of Honolulu That close proximity makes it a perfect vacation for the family. Amenities: When you're done experiencing all of Hawaii, know this: you've got it all in the Maile Sky Court, as in the awesome outdoor pool, spa tub, and sauna. You have spa amenities as well as beauty services and a hair salon. Look your very best in Hawaii! Or if you're the man of the family, treat your wife to beauty and spa services. Expert Tip: Hold onto your cigarettes until you're outside in the warm Hawaii air, because the Maile Sky Court presents only the best in quality as the whole property is smoke free. Cancel policies vary and based on seasonal dates, room requirements and group contract. The Honolulu International Airport is approximately 9 miles and 25 minutes away from the hotel. Rental car, taxi, or airport shuttle would be the transportation options. As a Holiday Inn Express standard our property offers complimentary hot breakfast buffet that includes a variety of eggs, breakfast meats, pancakes, cereal, etc. Open daily from 6:30am-9:30am (times subject to change with out notice). 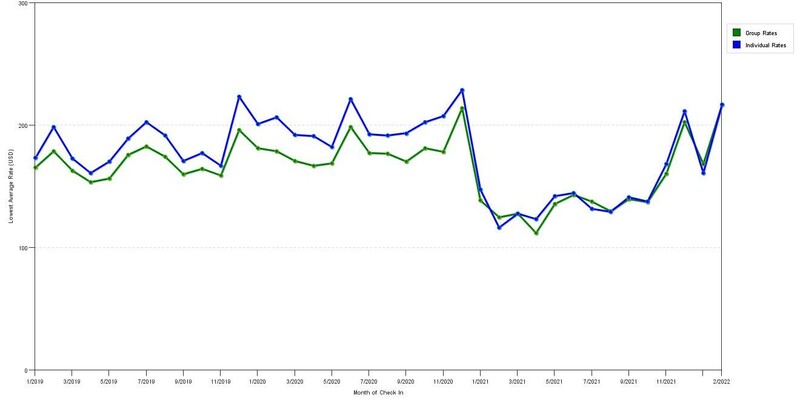 The graph above is trends of room rates for both our group quotes and the lowest online individual prices our system could find at the time the group offer was entered. The best group or meeting displayed is 29.2% in the month of October 2017 and the highest average individual rate is $229 in the month of December 2019. This chart will show past seasonality and also project future months. If you are flexible with dates, you may want to consider staying at Holiday Inn Express Waikiki in a month when rates are lower.